Reading was an important pastime in the Regency. With more leisure came more time. And more reading. 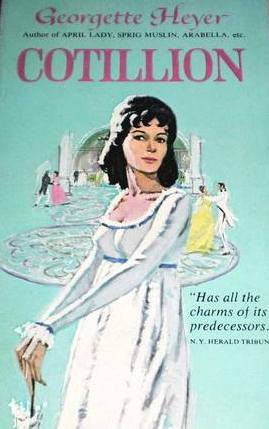 In Heyer’s Cotillion, the heroine has had more than enough leisure time at her guardian’s dreary country house, with nothing but her governess’s bookshelf to entertain–and educate her. She elicits the aid of the hero, who, if he can be persuaded to enter into a pretend engagement with her, will take her to London. There she might have the opportunity to bring the dilatory Mr. Westruther up to scratch. This is the copy I have–from 1968–the hair is a little That Girl, don’t you think? “Be a curst rum touch if he wasn’t, ” replied Freddy unequivocally. “Who?” demanded Freddy, out of his depth. “But there ain’t anyone!” argued Freddy. Then again, too much reliance shouldn’t be placed on a person’s reading selections as a guide to their makeup. This next series of posts is intended to illustrate how diverse a real Regency book can be, and its reader as well. For instance, a novel might deliver a moral tale better than a collection of the vicar’s sermons from Harrow-on-Gate. Also, females thought to be flighty because of their penchant for Gothic tales suddenly reveal themselves to have a will of iron. Just ask the Honorable Frederick Standen.